Home Business & Marketing How to Sell a Magic Illusion Show that You Don’t Have? You might have done a double/take when reading the title of this post. You did not read it wrongly. It does indeed state “How to Sell a Magic Illusion Show that You Don’t Have?”. If you are a commercial performer, the key to growing in your career is learning how to leverage off past projects to get bigger better ones. We all have to start somewhere and we build on the little things that we have done to secure bigger opportunities. Your past milestones are the building blocks for you to convince clients to book new shows that you are developing. One practical reason is financing. In business, this is called leveraging. If you want to stage bigger and more ambitious shows to grow your business as an entertainer but do not have (or want to spend) the money to build the show, you need to find a client to book the show in advance. In this article, I will explore 5 steps to pitch a new show to a client whether it is a show producer, event organizer, corporate client or venue owner. Specifically, this is a new show that you may have produced on paper but have not built until you get a client on board. This is an extremely important step in the process because you must sell what the client needs, wants or expects. Does your show (content, image, scale, budget and logistics) fit the client’s needs? What shows did the client book before? Are you different and better enough from shows that the client has used before? Does the client have any peculiar tastes, beliefs or quirks that you should be aware of? For example, If a show producer or venue owner does not like animal acts because they personally feel it is cruel to use animals in acts, a show that features doves or tigers may not be easily sold to him/ her. You also need to know if the venue that you intend to perform in is suitable for the show you want to present. If you are trying to sell an elegant sophisticated Mentalism show that requires an attentive audience, a disco or club might not be the best place to perform in unless the venue can be “transformed” for your show. The most effective way to sell your show to get a meeting with the client and present your proposal. The client needs to see you, feel your energy, enthusiasm and most importantly like you. Next, having a presentation meeting will ensure you have a captured audience to pitch your show. If you can’t interest the client in the first 15 minutes in person, it is unlikely an emailer or package mailed to him/ her will work better. If you are not confident in the sales presentation aspect of the meeting, hire an agent or sales representative who can fulfill this role. If you do that, you then play the role of the artiste/ show producer and allow the professional to do the selling. Request for a suitable location for your meeting to make it conducive for you to make a presentation. You do not want to meet in a crowded cafe or coffee shop. Be sure to specify any technical requirements that you may require like the ability to hook up a laptop to a projector (or digital TV) and project it onto a screen. Once you have secured a meeting, you need to create an awesome presentation that will sell the new show. In this day and age, I think a digital PowerPoint Presentation is the way to go so that you can incorporate text, images and video into one single presentation platform. Depending on the scale of your project, you can put the PowerPoint Presentation together yourself or even get a professional freelance designer to spruce up the presentation to give it an added wow factor. You can find freelance designers at Elance.com. Here are the essential components of the presentation. The bios consist of the profiles of all the relevant people involved in the show. This may include the main cast, producers, directors, choreographer, costume designer, music director or specialty positions. The bios should be brief with a promo photograph or head shot as well as key information points. You should include photos or short video clips that show relevant past experiences. You could also do a collage of photographs to create a single image that communicates your current brand and style. The show concept must effectively sum up what the show is about and hook your audience. This is very similar to a one-liner pitch for a movie. The show concept should be a short introduction to the show. Ideally, it should include a show name, tag line and visuals (logo or poster). You must state, in one sentence, what the show is about and most importantly, why it is different from anything that the client may have booked or seen before. I can’t stress how important this point is because your differentiation point or unique selling proposition (USP) is what will be of value to the client. The more unique your show is, the easier it is for the client to make a business decision. If the client is a venue owner, a unique show means it is easier to promote the show and sell tickets. It is essential that your difference must have commercial value. For a more in-depth discussion on how to create a differentiated entertainment project, check out my book “Big Money Shows: How to Book More Shows that Pay More”. A mood board is an arrangement of images, materials, pieces of text, etc. intended to evoke or project a particular style or concept. A digital mood board is probably the most effective approach to sell a show concept and give the client an idea how your show will look and feel. Advertising companies, event agencies, video production houses, interior design firms, stylists and many other creative professionals do this all the time as part and parcel of presentation pitches. The first step, of course, is defining the look, style and feel of your show. Is it supposed to be vintage, classic, modern, futuristic or have a specific theme? What is the color theme of the show costumes, props and sets? Once you know how your show should look, search for images or snippets of videos and text fonts that support your vision of the show. Look for images of sets, furniture, decorations, clothing or objects to create strong visuals for your mood board. The great thing with a digital mood board is that you can include different forms of multiple media. So, if a sample of the type of music you will use in the show will help sell it, play it for the client to hear. If you do intend to play music or video with audio, be sure to bring your own USB-powered portable speakers. 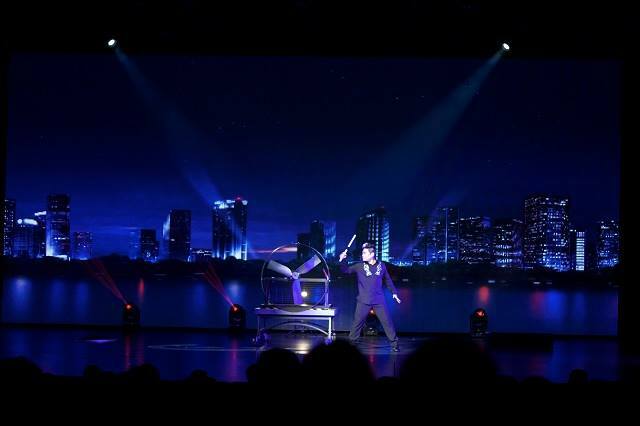 This part of the presentation highlights key acts, routines or illusions in the show. At this point, the client does not need the entire show run-down but you should highlight 3 – 4 acts. These acts should be the most impressive, memorable or exciting part of your show. It could be an award-winning act, a big illusion, prediction effect or something completely unusual. I personally like the “gimmick” of selling a “world’s first, never been seen magic effect or illusion”. I have used it successfully in many of my projects including a large number of mega stunts. However, if you do use this route, make sure that your “big trick” is really unique and you can deliver what you are selling. Ideally, you want to have images or videos supporting a one-line description of the acts. However, if the acts are new or use props/ illusions that you have not bought/ built yet, it is unlikely that you will have any images or videos to showcase the act. Use existing photos that you have that might be of a smaller scale but conveys the essence of the act. For example, if you are pitching a suspended upside down straight jacket escape but have not done it before, show a photo of you performing a regular, on the ground, straight jacket escape. Use text to highlight that in the new show, you will be performing the escape while suspended upside down. Photoshop images of you performing an act as a visual representation of the act you are proposing. If you are making an elephant disappear, photoshop an image of an elephant onto a picture of you presenting on stage. You will need to do some work finding the right photos to ensure the perspective is correct. A good photo editor will be able to blend the two images together if the perspectives are right. Note: You are not trying to deceive the client and pass off the photo as the real thing. You are using this photoshopped image as a representation only. 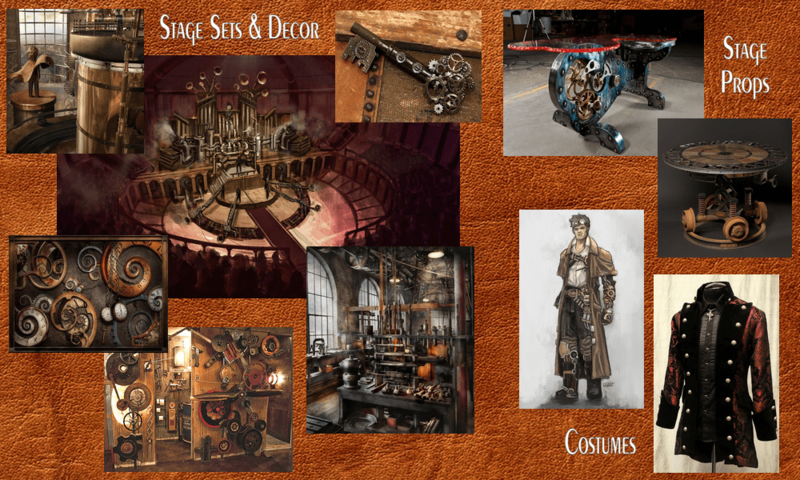 Hire a graphic designer to create artistic renderings and impressions based on images of the props/ illusion and draw you performing with the props/ illusion. If you are performing a specific prop or illusion that is built by a professional builder, speak to him and explain that you are pitching a show to a client. See if the builder is open to provide you a picture of the prop that you can use for your presentation. Look for public-posted content of props or performance photos of other magicians or illusionists to use as examples of magic effects or illusions that you will present in the new show. 2) You only use the content for presentation purposes and you make it explicitly clear to the client that the presentation is for their internal review only. After exciting the client and hooking his/ her interest, you need to address an important concern to the client – how much your show will cost. Depending on what stage of a pitch you are at, you might give a rough idea of the show budget or specifics. It depends if you are pitching for a one-off show or a run of shows. You should also highlight specific technical requirements or logistics that you might need to stage the show. The client will want to know if they have to make any special provisions and this will be cost to them. As magicians, we know how powerful a magic effect can have on a person. Nothing caps off a business presentation better than performing a strong piece of magic. Unless, you happen to be making the presentation on a theatre stage, you will likely be in a meeting room or office. More than likely, you will not be performing in an environment that is performance or magic friendly. So, don’t try to do anything too theatrical or does not fit that environment. A manipulation act or a Sub Trunk will not be suitable in this environment. Instead, do something that uses props that are fairly organic in such an environment. Ideally, borrow an object from the client or have him/ her involved in the magic that leaves a magical souvenir for him/ her. It does not have to be a stage piece, it can be a close up piece. Just be sure it is strong and memorable. Most importantly, find a way to relate what you perform to an aspect or actual act in the proposed show. For example, if you perform a strong piece of mind reading, explain that instead of reading one person’s mind, you will be reading the minds of 10 spectators. If you perform a Ring Flight routine; explain that you will do the same thing in your show but the difference is that the ring will appear in a nest of boxes that is suspended in front of the audience from the start of the show. Essentially, you want the client to imagine what his/ her audience will experience but at a larger scale. A printed copy of the presentation in a word document format with images and photos. This hard copy may have more information and details that you elaborate on. A flash drive or USB stick with the presentation in PowerPoint format as well as folders for images and videos of available. Leaving behind a copy of the presentation shows you have a complete and professional approach to selling your show. You are demonstrating that you are serious and this gives you some leverage when negotiating fees if the client decides to pursue the project. A hard copy of the presentation also allows the client to discuss the project with colleagues, partners or bosses. I have used this approach to selling big (and bigger shows) throughout my almost 20-year career with great success and I hope you can adopt some of the ideas for yourself. All the best! For you shared this amazing book. I translated your ideias and I noted your concepts. Certainly I’ll use in my next business.